of the printing are scheduled in the frame of the celebrations. in a proper way" Armenian Patriarchate of Constantinople announces . Karin, Yerznka, Yevdokiya, Kharberd, Marzva, Ayntap and elsewhere. By 1800 over 350 Armenian books were published in Constantinople. British Library until the end of January 2013.
specimens of the earliest Armenian printed books the library holds. followed. In Armenia, printing was introduced in 1771. YerevanMediamax/. National Library of Armenia (NLA) opened Book Printing Museum today, which introduces the history of printing in Armenia. The museum is located in Tamanyan building of NLA. NLA expressed the idea of establishing this museum in 2012, when Armenia was celebrating the 500th anniversary of Armenian printing, while UNESCO named Yerevan as World Book Capital. The opening ceremony of the museum was also attended by Armenia Minister of Culture Armen Amiryan. The six exhibition halls cover the period from pre-printing to modern printing. A large hall is dedicated to the “first-borns” of Armenian printing. 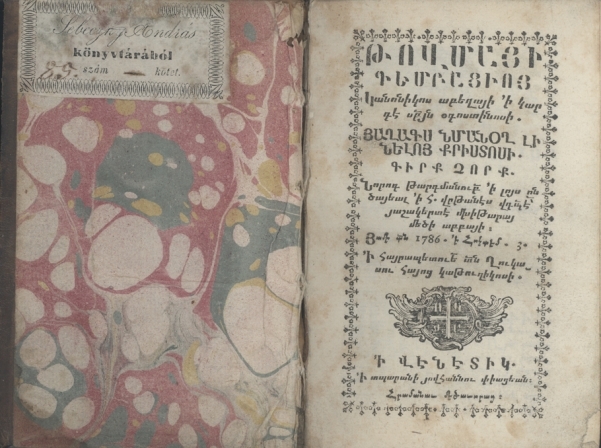 The visitors will be able to see “Urbatagirk” (Friday Book) first Armenian book, printed in 1512 in Venice, the first Armenian Bible, printed in 1666 in Amsterdam, and the first Armenian periodical “Azdarar”, printed in Madras. The museum features major centers of Armenian printing. Armenians built printing houses, used hot typesetting to publish book in European countries, Transcaucasia, the West and various cities of historic Armenia. “We have a very important exhibit in the museum. Three Armenian friends established a printing house in Shamakhi (currently in the territory of Azerbaijan) in 1848. Unfortunately, the museum does not possess the first publications, though we exhibit “Gitutyun Shnorhats” book, published in 1851. The house printed a large number of Armenian books,” Deputy Director of NLA Haykanush Ghazaryan said.